The ACT today announced that after a three year trial, a metre matters or minimum passing distance legislation will become permanent law. The Amy Gillett Foundation is naturally pleased with this result. 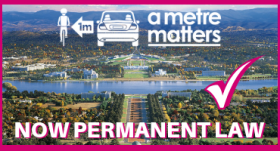 “We are delighted with the announcement that minimum passing distance laws are here to stay in the ACT. We look forward to continuing to work with the ACT Government and Pedal Power on additional measures to make the roads safe for cyclists, including education and enforcement of these important laws, and driver training on how to share the roads with cyclists” said Phoebe Dunn, CEO. Partners in pursuing safe cycling, Pedal Power, are equally pleased. “We have been awaiting the outcome of the review and are pleased the ACT Government has now confirmed the passing laws will be retained. Legal reform is an important step, but it needs to be backed up by a broader campaign of education and enforcement. Pedal Power ACT has received funding to develop an educational tool to show passing distances in relation to the real size of car and a bike, and we’ll be working with ACT Policing on using them in their operations.” said Ian Ross, CEO Pedal Power. We look forward to the education and enforcement of this legislation to deliver safe cycling to all on ACT roads.